My strategy for finding new species to add to my list during the last weekend in January was not to try too hard. I decided that I would just pick a couple of my favorite spots and let the birds find me. 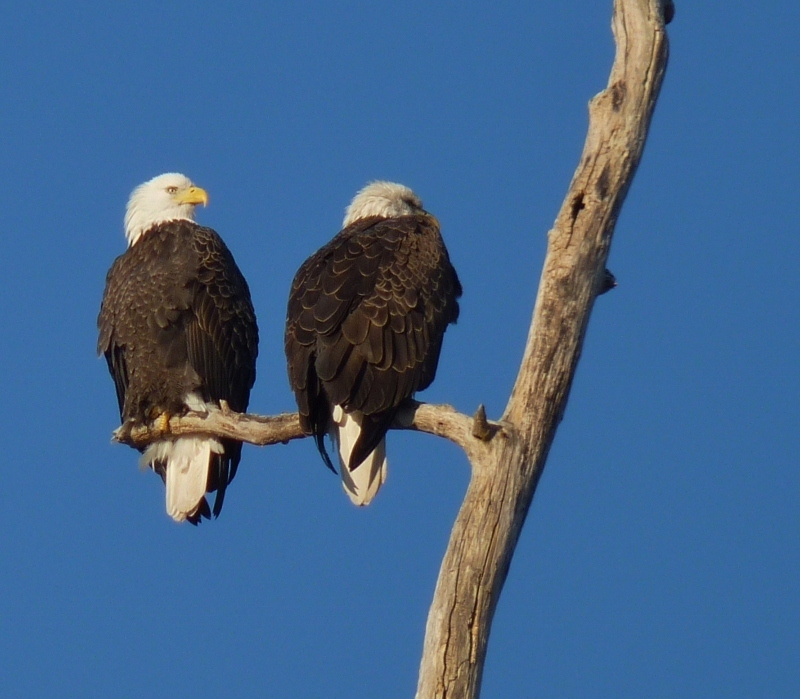 I found these two Bald Eagles hanging out in Middletown trying to catch a little sun. 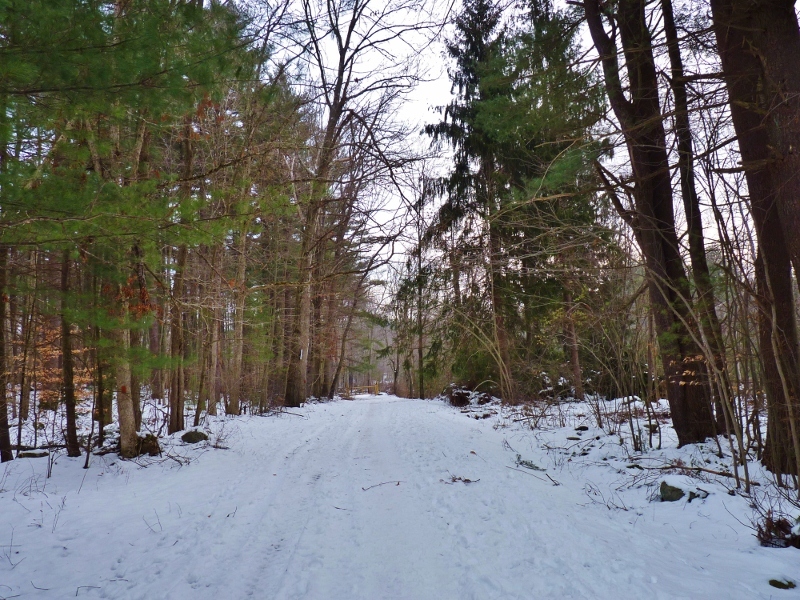 One of my favorite places to go birding is Machimoodus Park in East Haddam. There are remains of old stone walls all throughout the park. The best times for birding there are spring and summer but it's a great place to go for a walk any time of the year. 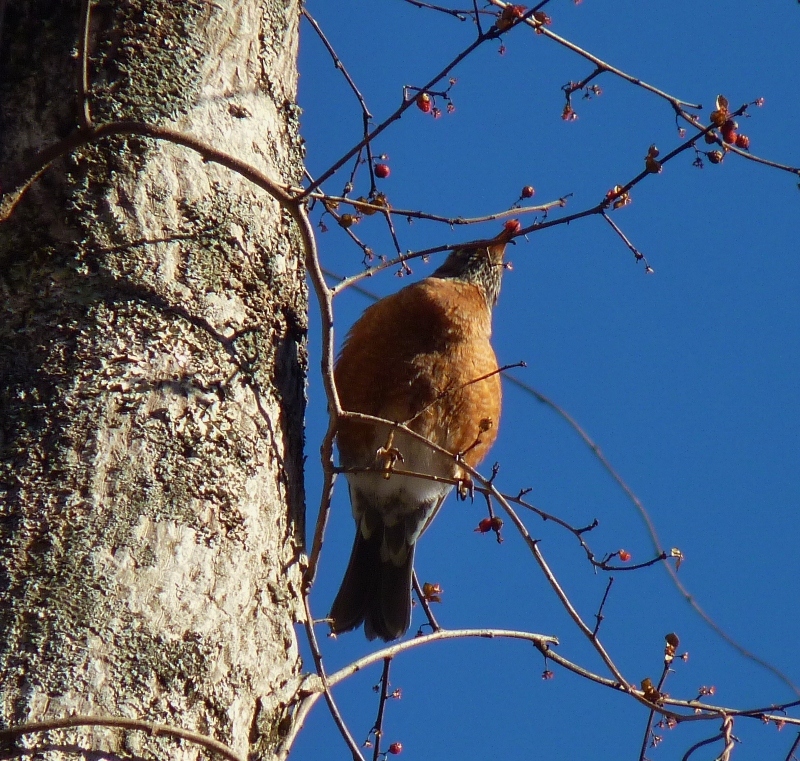 I didn't find anything add anything new to my list but was content watching familiar birds like this American Robin picking at some berries. The sound of robins, juncos, and wrens rustling through leaves on the ground brought life to a cold winter day. I managed to find 2 more species to finish the month. the first was a White-crowned Sparrow I found in South Windsor and the other was a Yellow-bellied Sapsucker I saw at Wadsworth Park. I ended the month with a total of 95 species total. Adding more to the list would have required chasing down individual reported species and I didn't want to do that (too much time and fuel). Seeing so many species of birds in January was a treat for me. It was great running into so many birders who were out braving the elements working on their own specific goals. Big January was just as it should be. A celebration of birds and the birders who enjoy finding them. I thought Saturday was going to be a nice day with temperatures in the 40's but I wasn't counting on the wind. As I was taking this photo the wind blew my tripod and scope over. After I took this photo a wave crashed over the rocks getting me and my camera wet. That was the last attempted photo of the day. 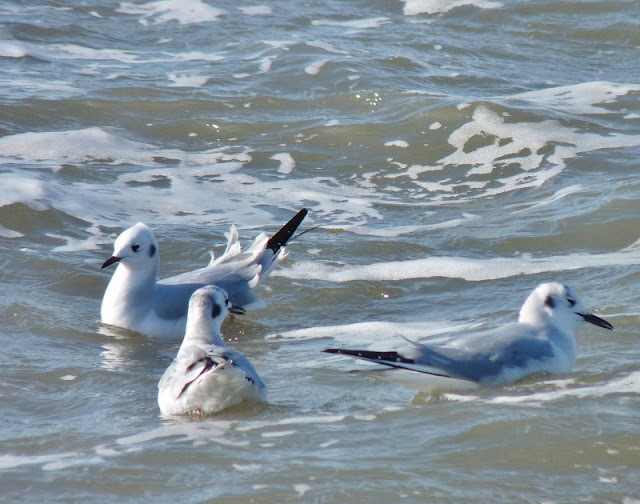 If these gulls could talk English they would probably say " Just go home you foolish human-you're not one of us!" I was determined to find at least 2 new species. Just as I'm certain there must be some form of life outside of earth in our vast universe, I also know that there's got to be species of birds at Hammonasset that I hadn't seen yet. I spent my time wandering around wondering if I'd ever find something new. Birding was extremely slow and my mind started to wander. It was full of scattered thoughts like fallen leaves blowing about in the wind. I wondered what can I post about with no photos and no birds? I started jotted down a few thoughts in the notebook as they came to me. I know I'm going to find my first Saw-whet Owl today so what should the post title be? I know- Some where I saw a Saw-whet". I was convinced that if I looked through enough cedar groves that this would be the day that I found a Saw-whet Owl. Birding proverbs-When it comes to birds seeing is believing but sometimes you have to believe to see them. I was going to come up with birding proverbs for a post but lost interest after I gave up on finding the owl. 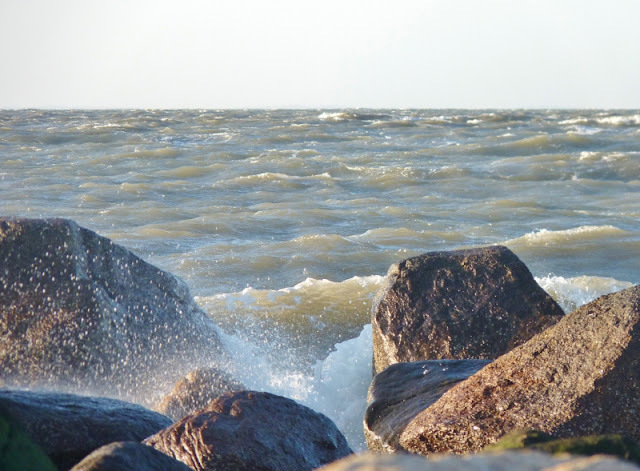 Birding tips-On windy days look for sheltered areas out of the wind to find pockets of birds. Nope, can't think of any more right now. I never see any birds down this trail and my instincts tell me I won't now so I'll go against my instincts and give it a try: I walked down one of my least favorite park trails where I rarely find anything. To my surprise, there was good number of shorebirds there but I couldn't positively identify them with my binoculars because they were too far away-which led to my next thought. Does anybody remember the show Match Game from the 70's? How about Match Game for birders? Why didn't you bring your.... ________________? Self motivation-At least I'm getting exercise I thought to myself as I took a long walk back to my truck to get my scope and then went all the way out to the end of the trail again. At least it paid off because I finally managed to add one species to my list: # 89 Black-bellied Plover. The weather grew a little more tolerable as the morning went on. I managed to find 2 more before my day was done-Savannah Sparrow and Surf Scoters. It was a slow day of birding but I managed to up my total to 91. 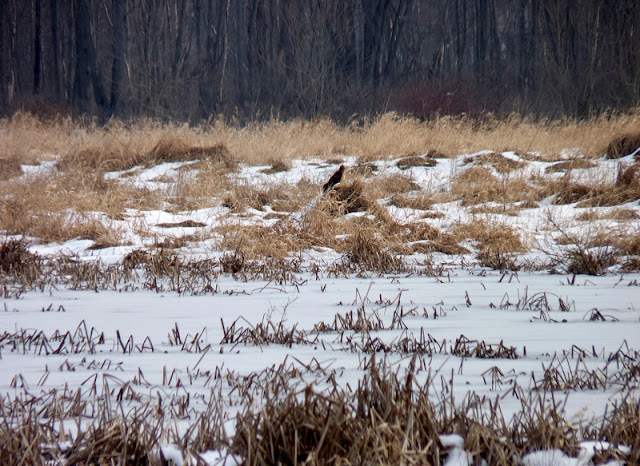 On Sunday I walked a mile near my home to find a single Red-winged Blackbird. When I returned home a Red-shouldered Hawk flew over my house crying out "keeyar keeyar keeyar". It was the easiest find of the weekend. It took some work but at least I made some progress. I'm at 93 now so I'm hoping to reach 95 next weekend. On Saturday I met up with a couple of birding friends for a carpool trip to the Western Connecticut Shoreline. It was cloudy and damp for the entire day but the birding was good. Joining forces with experienced birders made a big difference. I was able to add 33 species to my list for a total of 87 this month. 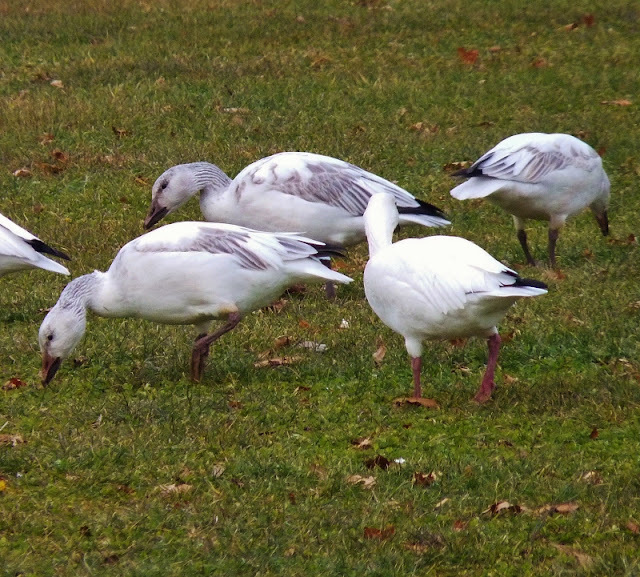 We had a few surprises too like these Snow Geese we found at Lighthouse Point Park. 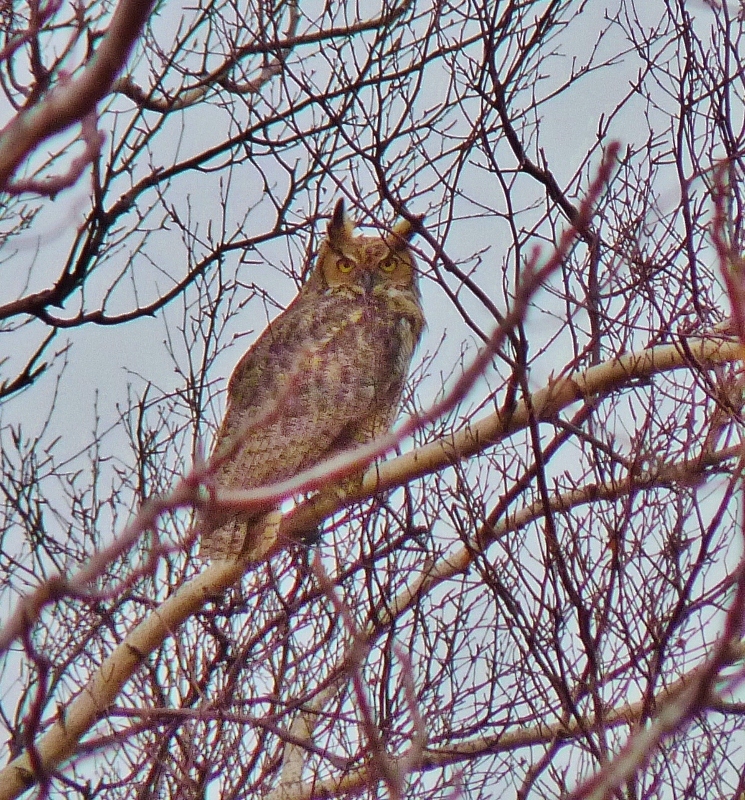 Finding a Great Horned Owl during the middle of the day was a thrill! Other great sightings included: Peregrine Falcon, American Kestrel, Merlin, Common Redpoll (Sherwood Island feeders), Palm Warbler, and Eurasian Wigeon (Mondo Pond). The western shoreline seems to be the most productive birding area of the state this time of the year. We stayed out from dawn till dusk on Saturday but didn't get out to do any birding Sunday. I'll have 3 more opportunities to get out this month to try to push my total past 90. Only 2 more species seems easy enough but the last few are the toughest to come by. I decided to stay in town to look for birds on Sunday. I started out in Meshomasic State Forest. I had a difficult time finding any birds there. It was so quiet that the cold air entering my nose made a whistling sound like the song of a distant bird. Interestingly, it sounded exactly like the first half of an Eastern Wood-Pewee call. there's no way a pewee would be around this time of year so I knew that my ears(and my nose) were playing tricks on me. The only birds I found in the forest were some of the more common woodpeckers and woodland birds but every one counts in January. After checking some power lines where I was able to add Field Sparrow and Golden-crowned Kinglet to the list I moved on to Wangunk Meadows. The fields looked cold and barren compared to what I see in the summer but I found several interesting species in the area. If you look out at that mound in the middle of the field you can see one of two Northern Harriers that were present. What you can't see in this photo is the flock of American Pipits which would take flight every so often and resettle to different areas. After spotting the harriers I saw a smaller bird of prey streak across the field. It looked falconish so I searched the area carefully to relocate it. I was rewarded by finding a Merlin perched on a dead tree near the river. If I was at a premier birding spot like Hammonasset then finding Northern Harriers, a Merlin, and American Pipits would just be a typical day. Finding birds like that right in town is much more of a thrill. Later that morning in parts unknown I saw a Bald Eagle sitting on a nest. 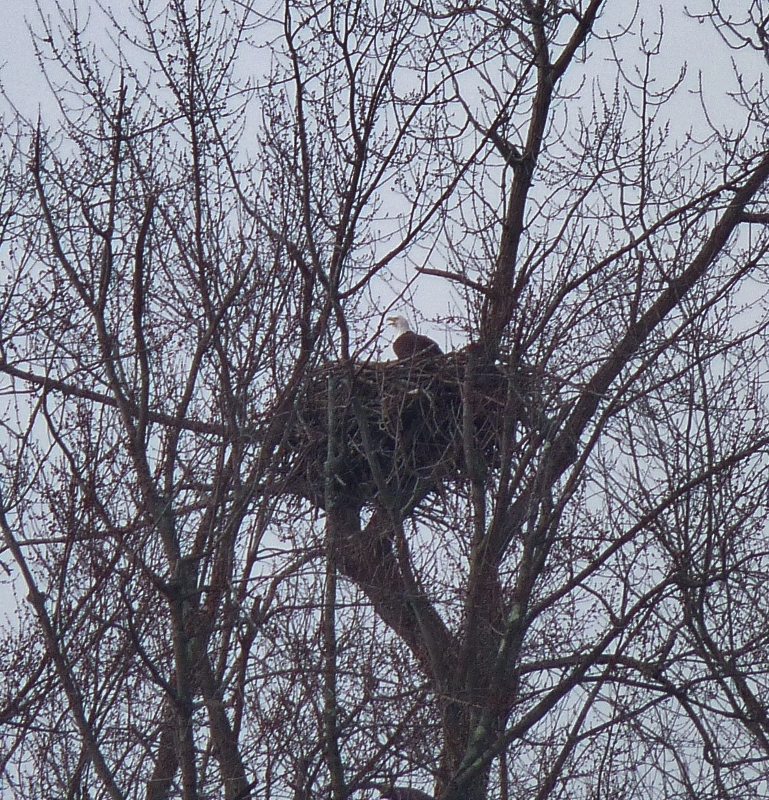 This photo was taken from a great distance so the eagle was not at all disturbed. It's great to see the Bald Eagles doing so well in Connecticut. When I first started birding they weren't nearly as common to see. As for this one-it's number 48 on the list. I'm at 54 species so far but I'm hopeful that I'll be able to increase that number quite a bit this coming weekend if the weather holds up. I saw a few birds while commuting during the week but Saturday was the first day of January that I went out birding. I started my effort to build a list at Hammonasset. It was cold and windy but I did manage to find a few interesting species. 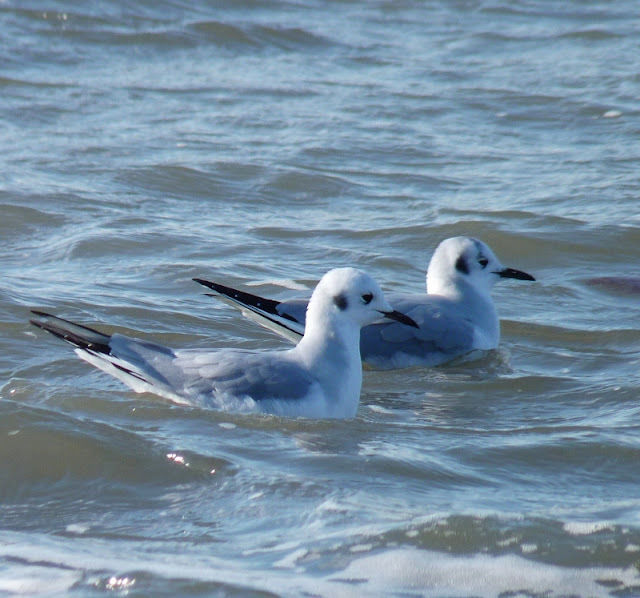 When I saw the gull in the photo I knew that it was different from ones I've seen before. I didn't have my field guide so I just snapped a few photos of it and then showed it to a nearby birder who knew his gulls (thanks Paul). 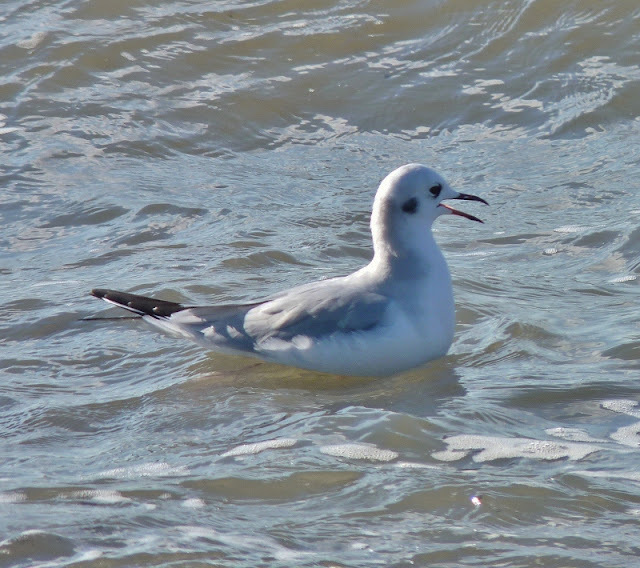 It is a Bonaparte's Gull. I found out that they are not that uncommon during the winter but they were uncommon to me because I've never identified one before. I've probably seen them fly past me before and just couldn't identify them. They are a small elegant gull that remind me of a tern in the way they fly around and feed.The black ear mark on the side of the head really stands out. Shortly after I saw the first Bonaparte's Gull a second one showed up. And then there were 3! 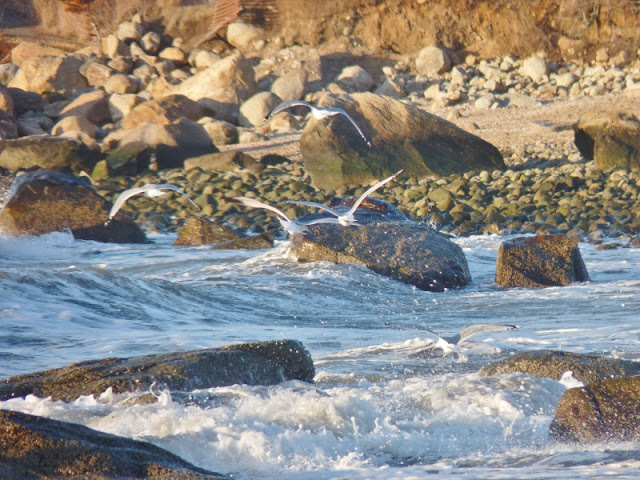 I later read in a field guide that they don't usually hang out with the other larger gulls but these 3 gulls were swimming and flying around ring-billed and herring gulls the entire time I was there. I spent way too much time watching these gulls when I should have been working on adding to my list! I think that I ended Saturday with about 40 species and added a few more on Sunday. I'll do a separate post about Sunday's birding but for now you can view my current list by clicking on the link below.